A year ago today, WooThemes released Subscriptions. At the time, I’d been developing Subscriptions for just short of 3 months. I made the first commit in Git on the 3rd of April, a measly 304 lines of code. The code base is now 40 times that size, with 12,000+ lines of code. It’s been a busy year! But cutting code has been only half the fun. The rest comes from being at the intersection of the rapid growth of the WooCommerce eco-system and the rise of subscription commerce. In December last year, I spoke at the WordPress Brisbane Meetup about being a WooCommerce extension developer. I included in my presentation a slide with a “A Brief History of WooCommerce”. The slide was intended to show WooCommerce’s explosive growth. Looking back, just 6 months later, I’m a little embarrassed – I thought 400k downloads was impressive? Last week, WooCommerce hit the 1,000,000 downloads mark. Just 6 months after the 400k mark. In the week since that milestone, there has been almost another 50,000 downloads. 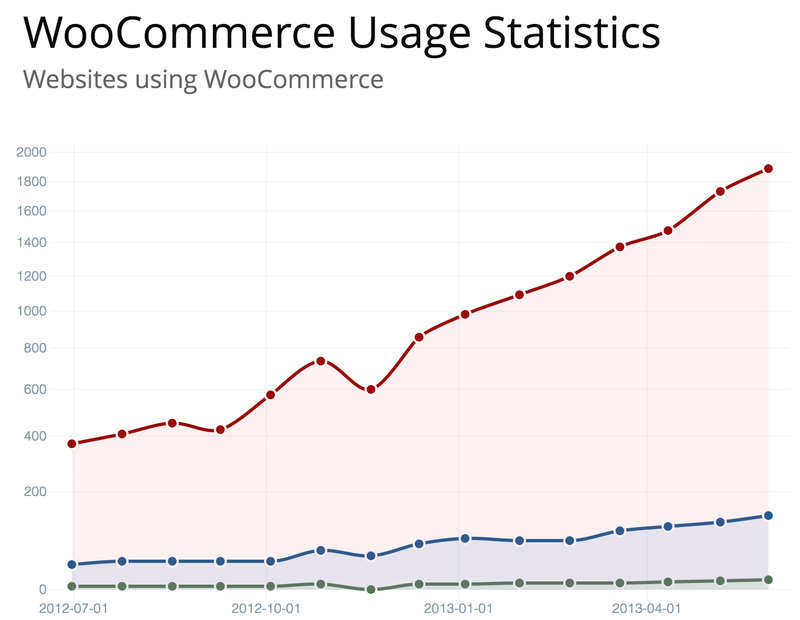 In fact, according to BuiltWith, WooCommerce is now the fastest growing ecommerce software on the web *. I started building Subscriptions simply because I’d found it way too hard to sell support subscriptions to my software. I knew I couldn’t be the only one with that problem, and saw the opportunity to build it on a new and growing platform. I figured people might use it for membership sites and perhaps even magazines. How naïve I was! Subscriptions is now used to sell nail polish, soap, gluten-free diet plans, fishing tackle, nappies, piano lessons, cleaning services, martial arts classes, desk space, razors, yoga passes and much more. There’s an inherent enjoyment in seeing someone build something new with your software. It’s especially enjoyable to see such creative and unique ideas come to life around something you’ve built. But then, ecommerce software also provides a pleasure not all categories of software can offer – the opportunity to help others make an independent income from something they love. Seeing people achieve that, and receiving feedback like the quote at the beginning has been the best reward in my first year with Subscriptions. I look forward to many more years for this reason above all. * When measured across the whole of the web. It lags behind when using figures for the top 10k, top 100k & top 1m sites, but I figure that’s just because it’s the new kid on the block. Big sites will clue on eventually. This entry was posted in WooCommerce, WordPress and tagged subscription commerce, woocommerce, WordPress. Bookmark the permalink. Congratulations Brent, your plugin is a very good one and I get a fairly amount of people requesting bespoke work. That’s an awesome WooCommerce stat from BuiltWith too! It sure has flown by! It’s almost a year since my last blog post too… which is no coincidence. omg. Thank you for 1.3.5.